The list of players with three home runs in a postseason game is fairly short. There’s Babe Ruth, twice. There’s Mr. October, Albert Pujols, George Brett. José Altuve, who did it two weeks ago, and Pablo Sandoval, who did it five years ago, and Adrián Beltré and Bob Robertson. Weirdly, there is Adam Kennedy, in a year where he hit seven home runs for the whole regular season. 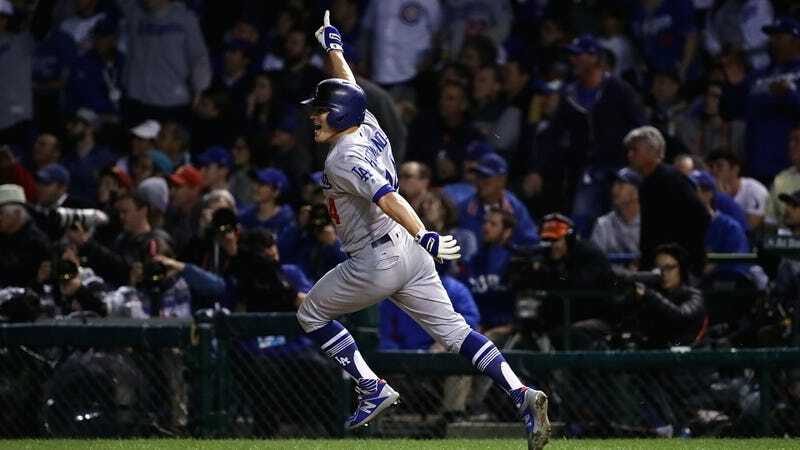 As of tonight, there’s Enrique Hernandez. That’s it. You can’t say Hernandez is the least likely member of that list, because, well, there’s Adam Kennedy and his .384 career slugging percentage. But he’s still pretty damn unlikely. The utility player’s bat has never been his selling point, to say the least. A modest power surge this year—a career-high ISO of .205, after failing to ever top .175—brought his home run total for the season only to the grand sum of 11. He was one of the weakest-hitting players on the Dodgers, ninth by slugging percentage. And he was still the one to pull off tonight’s historic feat in the 11-1 victory over the Cubs, which is the beauty of baseball’s single-game statistical marks like this: anyone can pull them off. Some players are just a hell of lot less likely to, and therefore a hell of a lot more fun to watch. In an interview afterwards, Hernandez described the pregame conversation he had with his mother, who watched back home in Puerto Rico on a television hooked up to a generator at his grandparents’ house. He promised to hit a home run for her, and she told him to focus on putting the ball in play instead. (Smart lady.) “Who cares about making contact?” he said he told her. “Everyone just wants homers.” Fair. Those homers sure looked good tonight.